Ok, so I've actually played this game way, way back when computers and their hardware to play games didn't cost an arm and a leg, maybe just half an arm and half a leg. The game I played relied on you being silent and sneaky. It required you to be stealthy as you tried to complete your mission which also entails you to quietly knock out certain people in order to assume their identity to get to your target. The game only told you that you were an agent designed to be the best assassin possible. I don't remember it having that much more of a back story. Not much more else that I can recall. When the first game to movie adaptation came out in 2007 I actually didn't see it. I only read up on it prior to writing this review. So there will be no comparison between the two. From what I read of that movie it was critically panned but was quite successful at the boxoffice. It was also a French-American collaboration. This new one is a German-American collaboration and has nothing to do with the 2007 movie which stars Timothy Olyphant as the title character Hitman or Agent 47. The 2007 movie was said to have a weak and confusing plot, dry acting and extreme violence. So I guess there's huge room for improvement. So what's this new reboot about? Well, here's where I start with the SPOILERS, SO DON'T READ ON IF YOU DON'T WANT ME TO SPOIL THE MOVIE FOR YOU. The movie opens with a narration of who the agents are. The agents are genetically engineered humans bred to be the perfect assassin. The man responsible for this program is Dr. Litvenko (Ciarán Hinds) but as soon as he is successful he realizes the danger that he has released into the world, he soon disappears. Years later an organization called Syndicate International led by Le Clerq (Thomas Kretschmann) is searching for Litvenko in order to restart the program for their own purposes. The search is led by a man called Dr. Delriego (Rolf Kanies) who is searching for Litvenko by compositing an old picture of Litvenko and his wife and child and aging it. Delriego finds her in Berlin but unknown to him Agent 47 (Rupert Friend) has hacked into his system and knows what he knows. 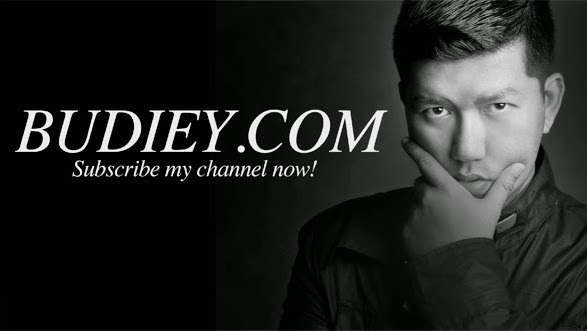 He triggers an alarm in Delriego's headquarters causing Delriego to flee. As Delriego tries to get to his safe house along with his security team they are taken out remotely one by one leaving only Delriego's car to arrive at the safe house. There Delriego finds Agent 47 waiting for him. Delriego is interrogated but is killed when he goes for the weapons cabinet which Agent 47 has booby trapped. Meanwhile in Berlin we meet Katia Van Dees (Hannah Ware) she is going through old census records of old Berlin in order to find a man she can't remember. Finding no clues and no one to help she leaves. On the bus she's wary of people and spots a man watching her. She gets to her apartment where we see a wall plastered with a map with all sorts of notes and pictures on top. She takes a couple of pills and fall asleep. She wakes up after having a vision of a bald man in a dark suit coming up her apartment steps. She takes what she cans and leaves. Not long after Agent 47 shows up. 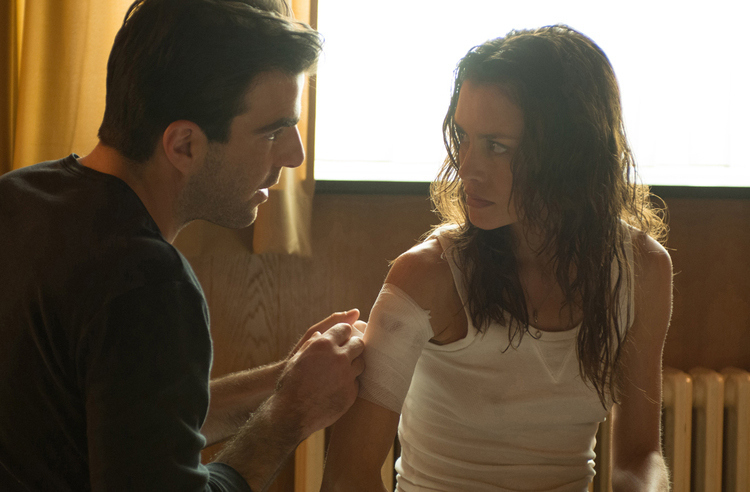 She runs to the subway station where she's stopped by a man named Johns Smith (Zachary Quinto) who claims her life is in trouble and if she wants to live to follow his instructions. Just as he relays his instructions Agent 47 spots them and takes a shot. Katia and John split only to meet up later at a parking garage. When their driver is shot in the head they run on foot towards the American Embassy where John discharges his gun in the air causing the Marines guarding the embassy to take them into custody. Agent 47 watches them from a distance. A little later while Katia is being questioned Agent 47 shows up fully armed with a briefcase holding a disassembled sniper rifle through the security gates which triggers the alarm. He's taken into custody. During his questioning he makes his incredible escape taking the clothes of one Marine officer to help his escape. Meanwhile John has escaped as well as goes to get Katia. They both managed to escape. The next morning Katia finds out who John Smith is, he tells her that he works for the Syndicate and is trying to help her find the man she's looking for, she's also told that the man she's looking for is her father. The Syndicate is looking for him in order to save him from being assassinated by agents like the one that's been chasing them. She believes him and as she questions him on what the Syndicate knows about her father based on the information she narrows down his location to Singapore which is also where the Syndicate is headquartered, but she doesn't share her discovery with John. Just as she makes her discovery she has another vision of Agent 47 coming through the door when a split second later he does. Agent 47 shoots John four times in the chest and knocks Katia out cold. Much later Katia wakes up and finds herself tied to a chair. Agent 47 approaches her and touches her shoulder which immediately triggers more visions, this time of bits and pieces of her childhood. Agent 47 offers her a choice to trust him or to go back to John. She asks why she should trust him and he offers only one answer, her memories. Katia takes Agent 47's hand and soon remembers the day she lost her father. She also remembers a bald little boy she spots while in the car as they drove away from the programs center, the boy was Agent 47. She believes him. Agent 47 tells her that she's like him, bred for a purpose, a reason. He walks away and tells her she needs to escape her situation on her own. Before he walks away he turns on a jet engine that's situated right behind Katia. As the engine starts Katia goes into a semi-trance-like state visualizing her escape. She does. On the walk out Agent 47 tells her that she took longer than expected and that everything from this point on will be a test. As they make their way out of the factory they're in they realize that soldiers have entered the building. 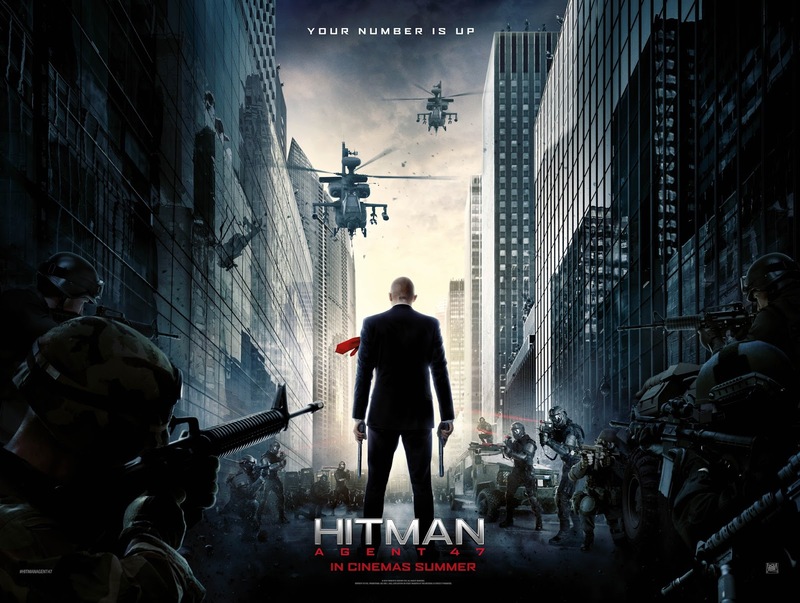 As Agent 47 takes each soldier out he tests Katia on what they should be doing next before taking her suggestions as action. He eventually takes all the soldiers out but is confronted by John Smith. It appears that John Smith is the Syndicate's attempt at re-creating the agent program that Litvenko started but with one major difference, John Smith has embedded titanium armor under his skin and an enhanced reflex response. 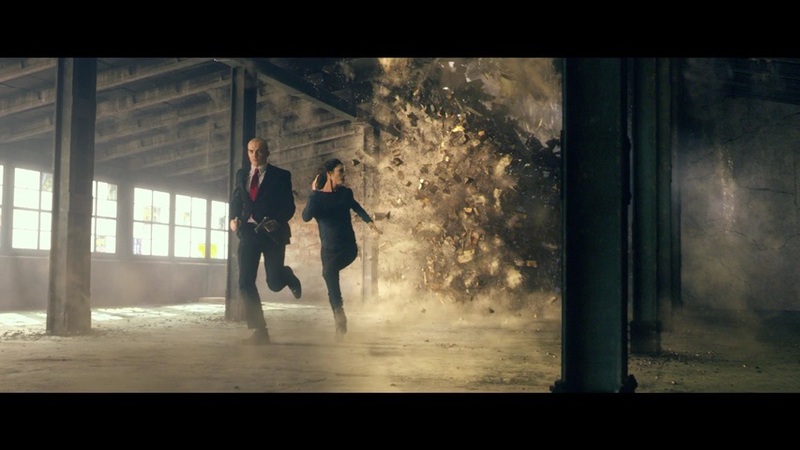 Katia and Agent 47 escape when Katia blows up a protective glass that separates them and a jet engine running at full blast. Katia and Agent 47 head to Singapore. 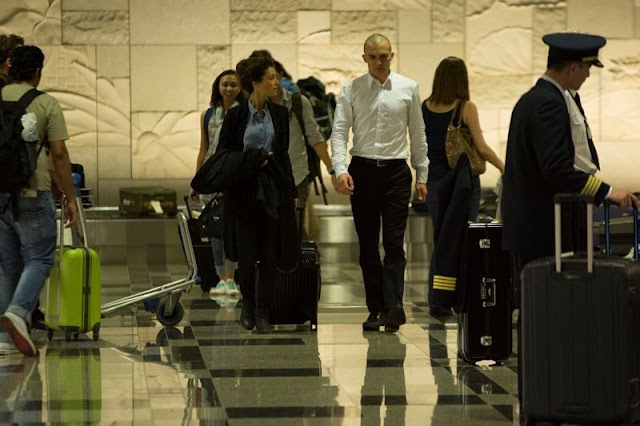 Arriving in Singapore Agent 47 gives her another test, to avoid all the surveillance camera in the airport and to meet him at the entrance. At their hotel the next morning Katia wakes up when she has a vision of armed men entering their room and just as she goes to get Agent 47 he wakes up and discovers that his guns are missing. After disabling the intruders Katia tells him that when she gets nervous she has a tendency to take apart things which is what she's done with his guns. They leave their hotel and head to the Singapore Botanic Gardens to look for Litvenko. They find him there but the reunion is short lived when they are attacked by plain-clothed Syndicate agents. The three of them make a run for it. Their escape takes them to a busy business district of Singapore where their car is shot at with grappling hooks which leaves their car immobile. A gun fight ensues but soon the three manage to get away and run down an empty road where unfortunately Litvenko is shot in the leg. Litvenko tells the both of them to leave. The two of them run into a street market but Katia protests and wants to go back to save him, Agent 47 knocks her out. Later at Syndicate headquarters, Litvenko is interrogated by John Smith. Le Clerq who has never left his office due to worries of security watches a video feed of the interrogation. Not liking what he sees he heads to the interrogation room. In the interrogation room alone with Litvenko he tries to convince Litvenko to change his mind, they are interrupted when Agent 47's voice is heard over the PA system. Agent 47 tells them that what they're looking for isn't just in Litvenko's head but is in fact in Katia all along. Katia was not born to Litvenko and his wife, they were unable to have children. Katia is actually the same as the agents and in fact earlier on in the movie Katia was told by Agent 47 that her name is actually a homophone of sorts, it is actually supposed to be quatre-vingt-dix or 90 in french. She is the 90th test subject in the agent series. On Agent 47's suggestion Le Clerq switches the opacity in the windows and spots a helicopter hovering right outside with Katia tied to the control stick. Le Clerq instructs his men to take Litvenko to a safe place. Katia listening in to everything decides to crash the helicopter into the building. She escapes her ropes and takes out all of Le Clerq's men. Meanwhile down in the lobby firefighters have shown up and among them is Agent 47. They both fight their way towards Le Clerq and end up at the helicopter landing pad at the top of the building. But as they busy themselves taking out Le Clerq's men, Le Clerq has gotten away in his helicopter with Litvenko. Litvenko looks from his seat at Katia and Agent 47 and as he says his goodbye he takes out an inhaler that Agent 47 had slipped into his jacket and presses down. The helicopter blows up. As soon as the helicopter explodes Agent 47 calls Diana, the handler in charge of all the agents. He confirms the death of Le Clerq which is the main target of his mission but as she asks for confirmation on the second target Agent 47 tosses his phone down the side of the building. Katia remarks that there's a man waiting for them on the opposite side of the door. When the door opens they find themselves looking face to face with another agent. So is this movie better than the one that came six years before? Well, truth be told I was watching the 2007 Hitman while I was writing this and I'd have to say yes it is. In what way? Storywise and the portrayal of Agent 47. I share the critics assessment of that movie in that the story was weak, had a confusing plot and the performance in general was unimpressive. Hitman: Agent 47 has a much simpler story to follow, in fact it's not really an original story. And in fact the story isn't so much centered on Agent 47, he's more of a tool to get the story to move along. If you actually read all that I wrote up there hopefully you'll get the idea that the core of the story is actually Katia. That being said the story is told fairly well. Though at times it did feel a little slow. The action has vastly improved as well as the tech shown used by Agent 47 but that shouldn't surprise you after all it has been six years since the first attempt. Fight scenes were shot differently with the director favoring close-up shots during hand to hand combat while gun fights were done stylistically using every style popular in recent action movies. The violence although quite graphic isn't as in-your-face as it was in the previous movie. Car chases were not bad but obviously meant to showcase the cars which in this case were sponsored by Audi. On to the actors. I was very much impressed with Rupert Friends portrayal of Agent 47. Not only did he really look the part but his performance for me was brilliant. There is a coldness in his eyes that suited the assassin and his expressions were subtle but suited to the scene. 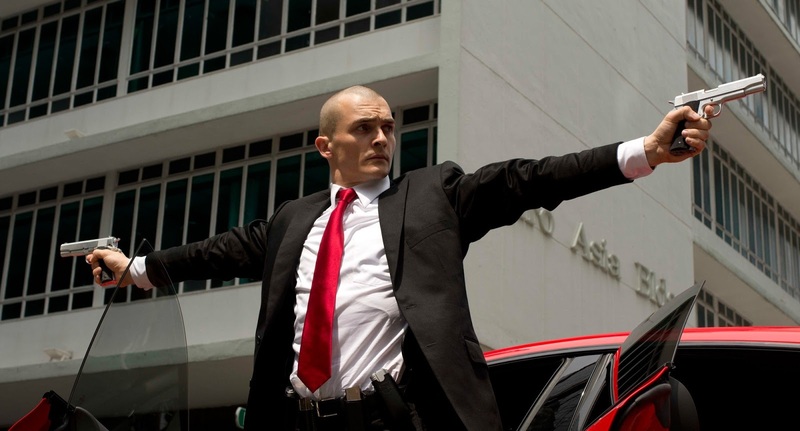 Everything about his performance of Agent 47 from facial expression to body language was good in my opinion especially when compared to Timothy Olyphant's interpretation of Agent 47. Hannah Ware was also pretty good. Believable as she goes from a girl afraid for her life to one that realizes that deep inside her is a killing machine. 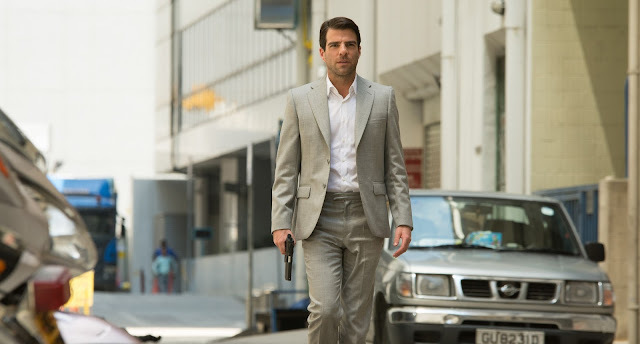 The one performance that I found disappointing or somewhat hard to believe was Zachary Quinto's John Smith. He is supposed to be similar to Agent 47 but stronger, meaner and more vicious but during their confrontations and during the interrogation of Litvenko I found his meanness and maliciousness to be somewhat hard to believe. Of course in the trailer you don't really know who he is and based on the trailer you're assuming he's some sort of cop trying to save the girl but when you sit and watch this movie and find out he's the opposite it's sort of hard to swallow let alone believe. All in all, this movie was not a bad movie. A good and decent action movie that I think does the game franchise some justice. The thing that sold this movie for me was Rupert Friend's portrayal of Agent 47, at this point I don't think anyone else could do better than what he's done for the character. Now that I think about it his performance reminds me of Robert Patrick who played the T-1000 in Terminator 2: Judgement Day (1991). There was a cold, methodical and precise look to his performance, suited to a man born and bred to be a killing machine but not hard enough to not fit in and even disappear into a crowd or stand out and be noticed. So there you go my review. And before I end it I'm going to give this movie a rating of 3.5 out of 5. A decent action movie with a good performance by an relatively unknown actor as a character from a game that few know and fewer have played. Not a bad movie to take a date to but mostly a guys movie. Definitely a movie for the person who's actually played the game. Also a lot better than the one that came before. And on a final note, John Smith doesn't die at the end because they show him opening his eyes right at the end of the main credits which means they're thinking of a sequel. 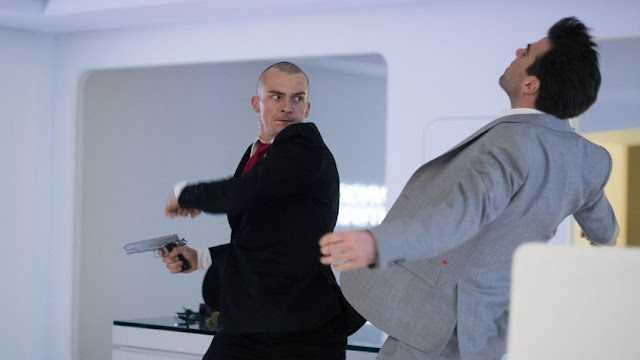 Hopefully Rupert Friend comes back as Agent 47 because I may not watch it if he doesn't. THANK YOU BUDIEY AND 20th CENTURY FOX MALAYSIA FOR THE PREMIERE PASSES!! 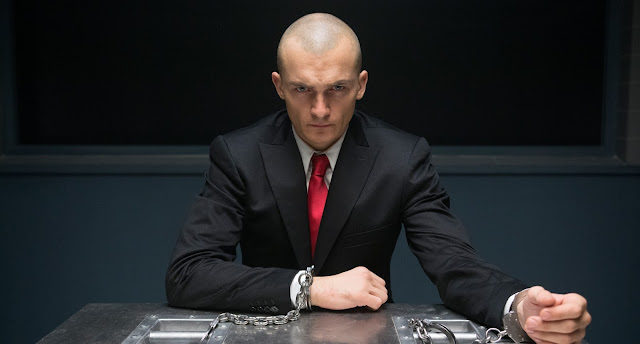 I am a big fan of Rupert Friend since he played the role of Hitman: Agent 47 specially when he appears wearing a black suit i always wanted the same at last i found it at Online Store the suit looks awesome.